Invariably, there is an upcoming event for which you are considering some special touches to both your dress and hair style. Just bend and snap! Bendini is the perfect way to up the glam factor. Just slide one in, bend and snap it shut. It holds on tight with comfort and style. Bendini has just the right accent piece to finish off your do stylishly. With quite long locks, my teen tester and I are always on the look out for new products to dress our hair. We received two styles of Bendini: a sophisticated metallic clip with crystal accents, as well as playful pink beaded clips. We found the Bendini clips very easy to use after a small amount of experimentation and they added a unique finishing touch! Scunci is generously offering That's What She Said readers a chance to win a Scunci Bendini Prize Pack. To be eligible to enter, you must follow That's What She Said via Google Friend Connect (mid right sidebar). This giveaway is open to residents of the US, 18+ and will end on Saturday, June 11, 2011 at midnight EST. The winner will be chosen randomly from all eligible entries. The winner will be notified by email and will have 72 hours to respond before I must move on to a runner up. Please leave your email address, in anti spam format, in your comment if it is not available via your comment name so I may contact you if you are the winner. Bonus entries are completely optional. If you are already liking, following, subscribing and such, please take the entries. To be eligible to enter this giveaway, you must follow That's What She Said via Google Friend Connect (mid right sidebar). For mandatory entry, please visit Scunci and tell me in a comment here something you learned or your favorite Scunci product. * Like Scunci on Facebook, leave comment here with your FB name, 2 entries. * Like That's What She Said on Facebook, mid right sidebar, leave comment here with your FB name, 2 entries. * Follow Scunci on Twitter, leave comment here with your Twitter name, 2 entries. * Follow That's What She Said (tsue1136) on Stumble, leave comment here with your Stumble name, 3 entries. * Subscribe to That's What She Said via email or RSS feed. Leave comment here with applicable name, letting me know which. 2 entries per method. * Share this giveaway in some other fashion, whether it be by blogging, stumbling, Digging, posting to a giveaway linky or other. Sharing must include a direct link back here. Leave a comment with a link to your sharing. 3 entries per each sharing. Handy share button at bottom of feature. * Tell me about an event you've recently been to or are planning to attend where you needed to glam up your do. What kind of special style did you sport? Congrats to Andrea V, comment #23, courtesy of Random.org! On behalf of Scunci and That's What She Said, thank you to all entrants for following and participating! I received Bendini products to explore for the purposes of creating this feature. The prize pack is sponsored by and will be shipped by Scunci. Information and images taken from various Scunci websites. The opinions above are both honest and my own. Thank you to Robin Leedy & Associates, Inc for the opportunity. Facebook is neither responsible nor involved in this giveaway in any manner. I follow via GFC I'm 4StephanieD on Twitter. Andrea G learned that bendini can blend in with your hair color. liked scrunchies on facebook 2 "andrea g"
liked "thats what she said on fb" 2 "andrea g"
liked "thats what she said on fb" 1 "andrea g"
entered "things remembered giveaway" 1 "andrea g"
entered 'things remembered giveaway" 2 "andrea g"
entered bodycology giveawy 2 "andrea g"
entered bel espirit giveaway 1 "andrea g"
entered bel espirit giveaway 2 "andrea g"
entered hard candy cosmetics giveaway 2 "andrea g"
I follow your blog and my favorite product is the crystal mini flower claw clip! I entered your bodycology giveaway, too! 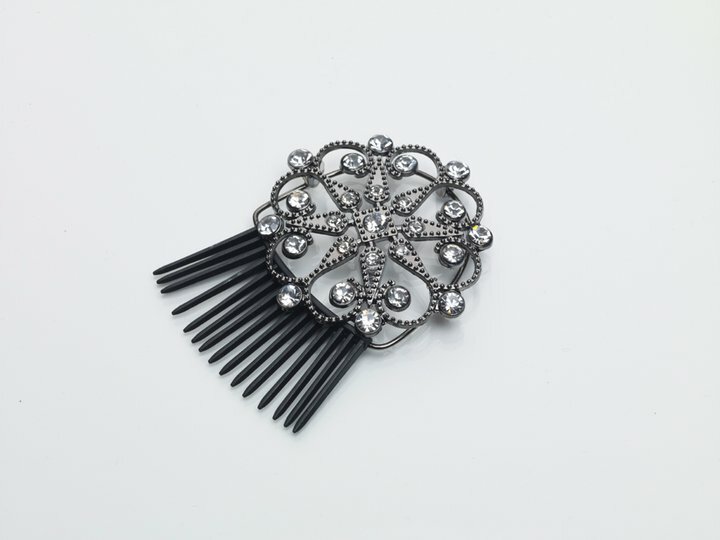 I love the classic Crystal bobby pins :] My favorite. I follow you on Stumble ! "kortney32"
I also entered the Bel Esprit giveaway.. I would love to wear these to my son's camp graduation in an up-do. Follower via GFC, and I like the tortoise clippies--pretty but very functional. I follow via GFC and I like the Scunci design weaver! Fun and colorful. I follow Scunci on Twitter as NCMommyofgirls. No-Slip Grip® Mini Octopus Clips is a favorite item of mine. They make it comfortable to rest your head on these clips. thanks. I entered the bel esprit Giveaway.